Study permaculture online through Cornell University’s distance learning program. Create a design portfolio based on your own project and complete all three of the courses from home to earn a Permaculture Design Certificate. Instruction and facilitation is led by Michael Burns of the Finger Lakes Permaculture Institute who has been teaching and practicing permaculture since 2005 at Cayuta Sun Farm. The first 6.5 week long course and provides an opportunity for you to build your knowledge about permaculture and ecological design. Participants will explore the content through videos, readings, and activities and complete portions of a design for a site of their choosing. While the course is online, the format is designed for consistent interaction between instructors and students through forums and review of assignments. Readings and presentations will be directly applied through hands-on activities students will engage with at home. Completion of a single class gives students a certificate of completion from the Cornell Dept. of Horticulture and Continuing Education units. Completion of all three courses gives students the portfolio necessary to apply for an internationally recognized Permaculture Design Certificate though the Finger Lakes Permaculture Institute. Michael Burns & Kelly Dietz created Cayuta Sun Farm to produce healthy food in an ecologicaly regenerative system. Permaculture is the central organizing framework of the farm. Learn permaculture with Michael and earn a Permaculture Design Certificate. Cultivate your ecological literacy by looking at complex symbiotic relationships in both natural and constructed systems. Explore and apply systems thinking to your own garden, farm, or backyard. This course is designed by Steve Gabriel of “Farming the Woods” and Wellspring Forest Farm with Michael Burns of Cayuta Sun Farm. Both are cofounders of the Finger Lakes Permaculture Institute. Michael Burns will be the course instructor. 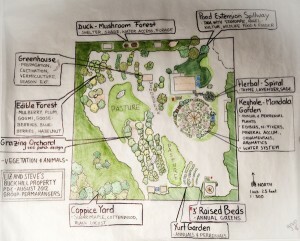 Learn permaculture while designing your own site.